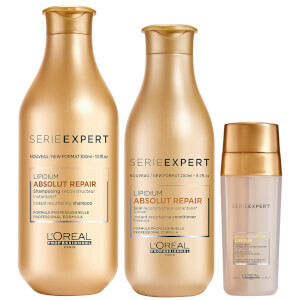 The L'Oréal Professionnel Absolut Repair Lipidium Shampoo and Conditioner Duo works to replenish your tresses while locking in essential nutrients. 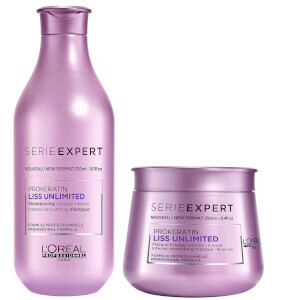 A reconstructing conditioner that has been inspired by skincare treatments. Like skin, hair is made of different layers, that can suffer from lipid-deficiency. Loss of lipids are caused by chemicals, heat styling and external aggressors including sun, salt and chlorinated water. Lipid-deficient means hair may break easily, styling will become difficult, coloured hair will fade and textured hair will lose its bounce. This technological breakthrough conditioner contains the most reconstructing ingredients to replenish all hair zones and create an insulating barrier to lock in essential nutrients to restore healthy-looking tresses. Conditioner: Apply evenly to shampoo towel-dried hair. Rinse thoroughly. In case of contact with eyes, rinse them immediately.